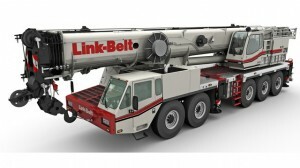 Brand new from crane manufacturer LinkBelt is the 210 US ton (185 tonne) capacity ATC 3210 all terrain on five axles. It is aimed at the US market and will be launched at the March 2014 ConExpo show in Las Vegas. The ATC-3210 is the second of the company’s ATs designed and built in the USA. It follows the first model, the ATC-3275, launched at the last ConExpo in 2011. The 200 foot (61 metre) fully curved profile boom is in six sections and there are seven extension modes to maximise capacities. It is made in-house by Link-Belt in Kentucky using ultra high strength steel. Tip height for the fully extended main boom is 210.9 feet (64.3 m) and the maximum tip height, with all extensions and jib, is 326.7 feet (99.6 m). Like the ATC-3275 the new crane’s upper engine is mounted transversely to maximise space for a stowable fly jib. The 12 foot (3.7 m) heavy-lift fly has two-line, one-load lift procedures for concrete panel tilt-up work. An optional three-piece bi-fold fly jib has hydraulic offset between 2 and 45 degrees. Also available is a manual jib with four offset positions. Easy road transport is a key factor so it is designed to meet the toughest transport laws in North America and its Cummins engine meets Tier IV final and EPA 2013 on-highway engine exhaust emission requirements, the manufacturer said. Multiple steering modes are controllable from the single carrier cab and the drive/steer configuration is 10 x 6 x 10. Suspension is Link-Belt’s Hydrogas and there is traction control with a mud and snow setting. Also available are locking differentials between the wheels and between axles. None of the counterweight slabs weigh more than 22,000 pounds. (9.98 tonnes) and they can be grouped with other components for transport. With maximum counterweight, rigging, matting, and fly jib extensions it can move in three 45,000 pound (20.41 tonne) truckloads, the manufacturer said. At just under 145,000 pounds (65.78 tonnes) the ATC-3210 can transport in a three-axle dolly configuration, including three-piece hydraulic fly jib, auxiliary lifting sheave, hook block and ball, main and auxiliary winches. Maximum axle load in that configuration is 20,000 pounds (9.07 tonnes). For easier maintenance large doors are designed for good access to engines, filters and other regular maintenance points. All connections and service points are centralised and easily accessible, the manufacturer said. The pressure for hydraulics in the upper can be checked from one place. Centralised lubrication with manual override is available.